For the next few minutes, please put aside all common sense, understanding of reality, and general resistance to outlandish alternate universes populated by robots, monsters, and overgrown toys designed to terrify children and adults; otherwise this review will make absolutely no sense whatsoever. Instead, please assume it is totally possible that we are all the dream of a break-dancing shred guitarist wearing an empty fried chicken bucket on his head. If this will be a problem, please skip to the last paragraph of this review at once. Buckethead first fought his quasi-nemesis (but not arch-nemesis) Bansheebot in 1992 in an epic, 58-second battle that took place in the first incarnation of the Bucketheadland theme park. The winner of this rumble – represented on record as only squeals and shred guitar – was never formally known, although if Buckethead is now in fact decoding Bansheebot’s tomb, we can assume that Bansheebot has since died, or has at least been forced into some kind of coma or suspended animation. Not much is known about how the actual process of tomb deconstruction works, although cattle prods and cows are apparently involved. We are left then to implore on exactly what level, if any, Buckethead has slain Bansheebot. Buckethead has faced many opponents both inside and outside of Bucketheadland, most notably The Shape, The Slunk, Cleopat, The Giant Robot, and Colonel Sanders, but the fates of most of those was resolved either directly in song or in later Buckethead-related literature. Bansheebot’s absence from the canon of the Bucketverse for so long implies that it was either handed a slow death (highly unlikely considering the high-speed duels of Bucketheadland) or was defeated by some unknown or unnamed ally of Buckethead, possibly Jowls or even Serj Tankian of System of a Down. 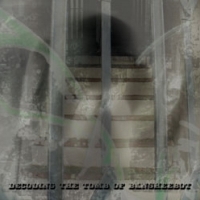 The counterpoint to this is the possibility that Buckethead is actually escaping from his nemesis’ tomb, and it is he trapped inside after Bansheebot instead defeated Buckethead, hence the need to solve it; if Buckethead’s goal was always in fact to reconstruct the chicken coop of his youth, as he has claimed, it would not form any kind of sensible conclusion if Buckethead were then to explore his nemesis’ final resting place. However, if we are to accept this idea then we must also assume that the chronological space between 1992’s Bucketheadland and the present day is merely a span of time as perceived by the defeated Buckethead, rather than any actual time, and that Praxis’ outstanding debut was not an album named Transmutation but was really a full-out, quasi-lucid transmutation of both our perceived reality and the physical world around not our collective selves, but around Buckethead and only Buckethead. Does any of that make sense? Probably not, and it shouldn’t. But this is Buckethead. Nothing is simple, everything is weird, and the less you know the easier it is to enjoy. After 22 solo albums, a boxed set consisting of five 45-minute songs, active membership in 17 bands and being fired from Guns N’ Roses, it seems unlikely that anyone’s going to take the time to catch up with an ever-growing back catalog and an increasingly psychotic back-story. Best just to listen and take note that Decoding the Tomb of Bansheebot may be one of the avant gunslinger’s most listenable – although certainly not most compelling – albums in years, and as always there’s plenty for guitar freaks to enjoy. It’s Buckethead’s world; we are only perplexed by it.